View videos of each sale bull by clicking on the lot number below. Dal Porto Livestock, Brentwood, Calif. Lot 5 – $22,500 – ABS Global, DeForest, Wis. Lot 84 – $15,000 – Dikoff Ranch, Onaka, S.D. Lot 1 – $14,000 – Denny Danielson, York, Neb. Lot 12 – $14,000 – Ami Hauxwell, McCook, Neb. Lot 72 – $12,500 – Steve Blank, Wilcox, Neb. Lot 130 – $11,000 – Jim Vinton, Tryon, Neb. Lot 132 – $10,000 – Jim Vinton, Tryon, Neb. Lot 653 – $11,000 – Earl Enix, Centennial, Colo. Lot 654 – $8,500 – Rocking J Ranch, Cody, Neb. View 2016 Sale Book here. Selling Fall Angus and Yearling Angus bulls. Selling 2014 Fall Bred Heifers. 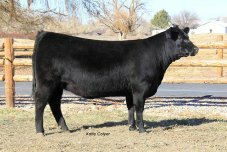 View videos of each sale heifer by clicking on the Lot number below. View the 2015 Sale Book here. Selling 18-month-old and Yearling Angus bulls. Hereford bulls from the Hoffman Ranch, Thedford, Neb. All bulls are range ready, fertility tested and backed by strong performance records and pedigrees. Each has met the stringent criteria to carry the B/R prefix as a herd sire and represent Rishel Angus genetics. All bulls are guaranteed against breeding injury for the first breeding season. Buyers that cannot attend the sale can participate in the Rishel Angus Sight Unseen Purchase Program that comes with a buyer satisfaction guarantee. Also selling an outstanding set of Hereford bulls from the Hoffman Ranch, Thedford, Neb. We are also offering 20 head of 2013 Yearling Heifers. TD Angus is pleased to share its genetics with fellow seedstock producers and cow-calf producers from across the United States and in several foreign countries. 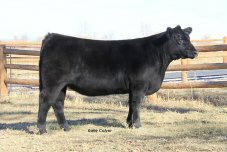 In addition to selling TD Angus bulls and females into 45 states in the United States. TD Angus genetics have sold to cattlemen in Argentina, Australia, Canada, Columbia and Brazil. 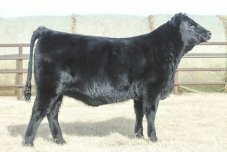 TD Angus at Rishel Ranch Next Generation Herd Sire Sale – always the third Monday in March. 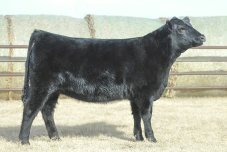 TD Angus Females – Sold private treaty or through special consignment. Sold 1/17/2014 to Lylester Ranch, Henderson, Nevada for $6250. Sold 1/17/2014 to Sydenstricker Genetics, Mexico, Missouri for $7,000. The two Miss Wix heifers are full sisters to the Lot 39 heifer in last year’s Foundation Female Sale that sold for $11,000 to Peterson Angus, Alcester, S.D.